Catastrophic flooding in Nebraska has wiped out roads, over-topped dams, and left at least a third of the Offutt Air Force Base submerged, highlighting the ongoing threat that extreme weather poses to both people’s lives, and national security. Now, the Omaha World-Herald reports flooding of at least a third of Offutt Air Force Base, including part of the runway and at least 30 buildings. 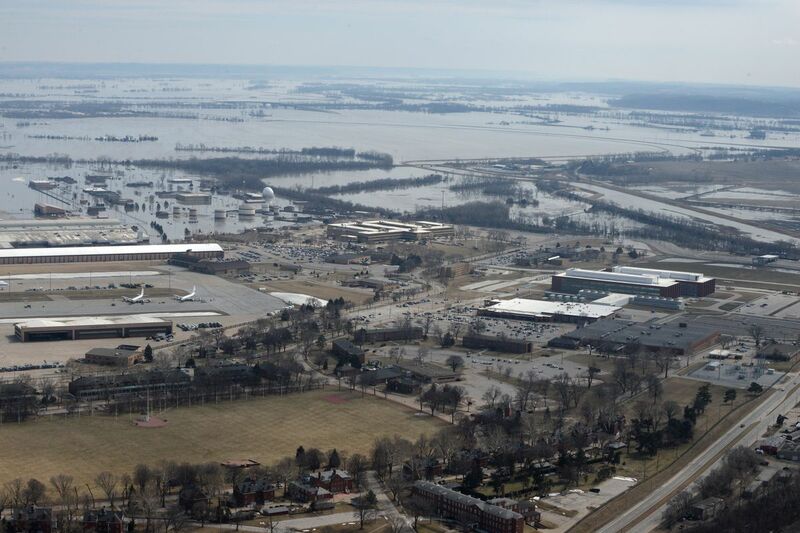 The floods forced aircraft to evacuate, but the headquarters of US Strategic Command, which oversees the US nuclear arsenal, remained unflooded, according to the World Herald. This kind of extreme flooding threatens military readiness and, in this case, our nuclear capabilities, according to Francesco Femia, CEO of The Center for Climate and Security. Officials couldn’t tell the World-Herald when operations were expected to go back to normal. “It is extremely clear that we face a grand challenge,” Colonel Michael Manion, 55th Wing Commander, said in a Facebook post. The base has been hit by extreme weather before, when a tornado whipped through the base in June 2017. The twister caused $20 million worth of damage, but, amazingly, no deaths. Offutt is the latest in a string of military installations to be hit by extreme weather, Weather.com reports. Marine Corps Base Camp Lejeune in North Carolina was badly damaged after Hurricane Florence struck the region in September 2018, for example. The storm led to a massive 84,000 gallon sewage spill on the baseand damaged buildings so badly that repairing and replacing them is expected to cost some $3.6 billion dollars, according to Marine Corps Times. A month later, Hurricane Michael devastated the Florida panhandle — including Tyndall Air Force Base, causing billions of dollars in damage. The Foodbank for the Heartland is currently working on a disaster relief plan with other organizations across Nebraska and Central Iowa. More information about how to donate funds and food for those affected will be available on their websiteonce the plan is finalized, according to Stephanie Bayle, Foodbank for the Heartland’s brand manager. Previous Previous post: Who’s to blame for the neurotoxin that’s poisoning the Pacific?